The decision in the Van Dyke cover-up case highlights what's wrong with the system that puts people on the bench. Until that's fixed, there will be no true justice. 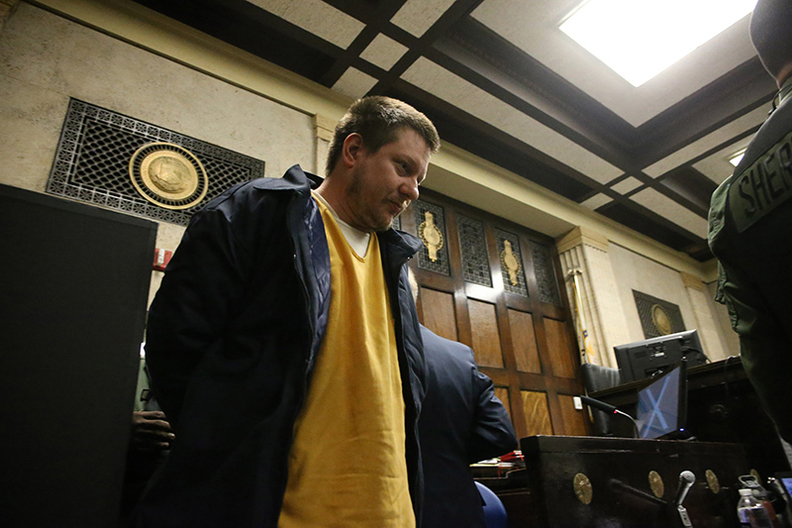 Former Chicago Police officer Jason Van Dyke enters court for a hearing in December. Like a bad movie or a Chicago winter, the horrors of our criminal justice system seem never-ending. The latest headlines prompt the question of why, after a jury found officer Jason Van Dyke guilty of second-degree murder and 16 counts of aggravated battery in the killing of Laquan McDonald, three of his police colleagues were found innocent yesterday of charges that they conspired to cover up his misdeeds. Like most of you, I wasn't in the courtroom and didn't follow the cover-up case blow by blow. Maybe there's some detail or nuance I'm missing. But from my vantage, it looks like both the jury in the Van Dyke case and Cook County Circuit Court Associate Judge Domenica Stephenson reached utterly different conclusions about what to believe, even though both reviewed basically the same evidence. So, why? Did the jury get bamboozled? Or is it that Judge Stephenson, a former prosecutor, viewed everything through the lens of a tough-on-crime cop? I'd like to think it's not the latter. But it sure looks like the judge, who didn't return my phone call, essentially bought the line that any policeman anywhere can shoot you dead and ask questions later if you don't instantly follow orders and throw yourself to the ground. After all, that cellphone in your hand could be a revolver, especially if you're not an old white guy like me but a black guy in dreads or a Latino with tattoos. Actually, in this case, it goes further than that. According to mayoral candidate Lori Lightfoot, a former federal prosecutor who later headed the city's Police Board, Stephenson and the key defense attorney in the cover-up case worked closely with each other in the Cook County state's attorney's office earlier in their careers, a fact that was not known to prosecutors until just before the case went to trial. Had they known earlier, the special prosecutors handling the case could have asked the judge to recuse herself, Lightfoot says. Or the judge could have come to that realization herself. But it didn't happen. It's the latest in a series of high-stakes trials in recent years in which judges, who perhaps don't want to rile politically powerful police unions, tend to let police off the hook, however strong the evidence. There's been lots of contentious debate lately about what's needed to finally fix our criminal justice system. And some good things are happening, so don't lose hope. The terms of a federal court consent decree laying out specific improvements are all but hammered out. More time, effort and money are going into better training police. Steps are being taken to extend special help to officers, who literally put their lives on the line, in the event the job becomes too much.